French: Philépitte veloutée; German: Seidenjala; Spanish: Asitis de Terciopelo. 5.5-6.5 in (14-16.5 cm); 1.1-1.3 oz (31.5-37 g). Breeding male: almost completely black with greenish caruncle over each eye and blue stripe between caruncle and eye. Female: olive-green with pale yellow blotches on underparts. Understory, lower levels of canopy, and occasionally in the canopy of primary rainforest, degraded or logged forest, and in secondary forest; from sea level up to 5,900 ft (1,800 m). Often forages in small groups or pairs, but sometimes alone. May also join mixed-species flocks. Primarily frugivorous (e.g., Melastomataceae, Pittosporaceae, and Rubiaceae), but also feeds on nectar and insects. Breeds July-January; northern birds breed earlier than southern birds. Pear-shaped nest, woven of moss and palm fibers and lined with leaves, is hung from a low branch in a shaded location. Usually lays three white eggs. Only the female has been observed to incubate, but both males and females have been recorded feeding young. Not threatened, and common in suitable habitat. 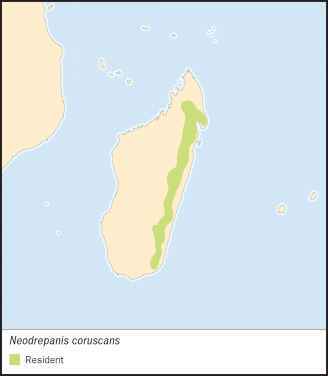 However, loss of rainforest habitat in Madagascar may threaten its long-term persistence. Neodrepanis coruscans Sharpe, 1875, Madagascar. French: Philepitte faux-souimanga caroncule German: Langschnabel-Nektarjala; Spanish: Asitis Caranculado. 3.7-4.1 in (9.5-10.5 cm); 0.2-0.3 oz (6.2-6.6 g). Small bird with long, decurved bill. Male: blue-brown upperparts, dull yellow underparts with brown streaks on breast, blue caruncle around eye. Female: brown upperparts, light brown head, dull underparts with yellow on flanks and under tail. 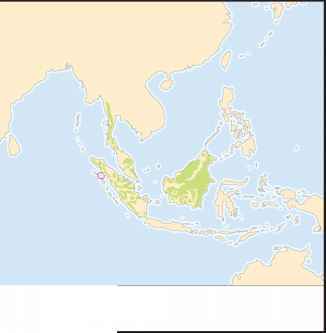 Understory, lower levels of canopy, and occasionally in the canopy of rainforest and in secondary forest from sea level up to 4,000 ft (1,200 m). Forage alone in or pairs, actively moving through the understory to visit flowers; sometimes feed in association with other nectarivorous birds, such as white-eyes and sun-birds. Primarily nectarivorous; observed feeding at a variety of flowers including Balanophoraceae, Balsaminaceae, Loranthaceae, Rubiaceae, Clusiaceae, Melastomataceae, and Zingiberaceae. Also eats insects and spiders, often searching in moss or on branches for these invertebrates. Poorly known. Breeds August-December. Pendulant nest of moss, leaves, and twigs is hung from a low branch. One nest contained two pale green eggs. Only female has been observed incubating and feeding young. Not threatened, and common in suitable habitat. However, loss of rainforest habitat may threaten its long-term survival. Lambert, F., and M. Woodcock. Pittas, Broadbills and Asities. Sussex, UK: Pica Press, 1996. Langrand, O. The Birds of Madagascar. New Haven: Yale University Press, 1990. Irestedt, M., U. Johansson, T. Parsons, and P. Ericson. "Phylogeny of Major Lineages of Suboscines (Passeriformes) Analysed by Nuclear DNA Sequence data." Journal of Avian Biology 32 (2001): 15-25. Prum, R. "Phylogeny, Biogeography, and Evolution of the Broadbills (Eurylaimidae) and Asities (Philepittidae) Based on Morphology." Auk 110 (1993): 304-324. Prum, R., R. Torres, C. Kovach, S. Williamson, and S.
Goodman. "Coherent Light Scattering by Nanostructured Collagen Arrays in the Caruncles of the Malagasy Asities (Eurylaimidae: Aves)." Journal of Experimental Biology 202 (1999): 3507-3522. Prum, R., and V. Razafindratsita. 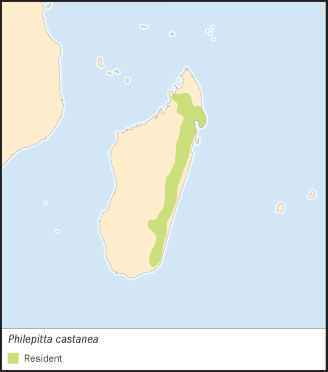 "Lek Behavior and Natural History of the Velvet Asity (Philepitta castanea: Eurylaimidae)." Wilson Bulletin 109 (1997): 371-392.